In a weekend full of great fights, a few encounters are bound to fly below the radar. Considering the state of the UFC and their mammoth schedule, a contest between undefeated prospects like Colby Covington and Warlley Alves would normally be main card material. However, it is currently situated on the Fox Sports 1 undercard of UFC 194. The bout is a classic example of Joe Silva matchmaking. Both fighters joined the promotion last year and have built 3-0 records inside the Octagon. Instead of continuing to schedule these fighters against middling opposition, the UFC has created a matchup between top prospects. Covington is currently ranked 36th and Alves ranks at 39th. The former Oregon State wrestler was actually ranked as the 338th best welterweight before joining the UFC. Alves, who had fought extensively for a higher profile promotion, Jungle Fight, held the 98th spot. The following chart shows the progression of both fighters in terms of ranking points over the last two years. In terms of level of competition, Covington was facing the easier schedule until he took a big step up in competition against Mike Pyle in his last fight. Pyle’s highest quarterly ranking is 9. Covington’s previous opponents were Anying Wang, who has never been ranked, and Wagner Silva Gomes, who has topped out as the 252nd best middleweight. Alves’ UFC opponents, Marcio Alexandre Jr. (174), Alan Jouban (59) and Nordine Taleb (80) have never been ranked in the top 50. 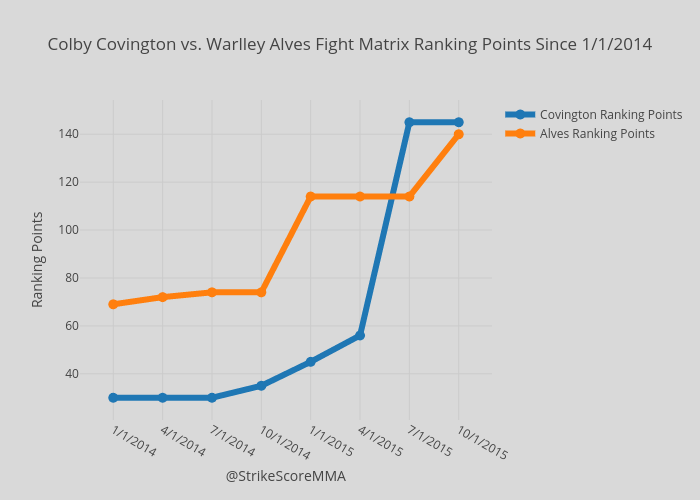 In terms of the fight, Covington is a slight betting favorite and for good reason. His All-American wrestling background should serve him well in this fight. If he can keep the fight on the feet or avoid submissions, he should be able to take this one. Alves’ only realistic route to victory is via submission. Of his three victories inside the Octagon, two have come by way of guillotine choke. The other was a dubious decision victory over Jouban in which he was outstruck 47 to 182 on the StrikeScore scale.